I think making twelve blocks at a time is working well for me. It's enough to keep me interested and engaged but by the last one, I am ready to focus on other things. It will be fun to get back to it at the end of next month. Thanks for reading! I've truly missed blogging over these past several weeks but I had a lot of deadlines to meet and I didn't want to pop in with one of those posts where I said something like, "Yes, I am sewing but I can't show you anything yet, so here's a picture of my kids fingerpainting." These two really have been keeping me busy. Sometimes I wonder if I will ever sew again! Summer brings its distractions too, my parents live only 25 minutes away and we have been swimming every chance we get. I also was addicted to this book and really got sucked into Burn Notice Season 6 (not my typical kind of choice for TV viewing - but it's good!). Oh wait... I said I didn't want to do a non-crafty post. I actually have been doing A LOT of sewing - I have completed 3 larger sized quilts, from start to finish, within the past month or so. I'm kind of tired. It's a very simple, easy quilt to make and based on a design I did a while ago. It is a perfect pattern to feature that large scale fabric that you just can't cut into tiny pieces. I backed it with one of my most favorite Amy Butler prints from her Daisy Chain line and bound it in a small green dot from my stash. Laurena was kind enough to squeeze me in at her longarm studio at the last minute - I did a quick wavy line design with occasional swirls. 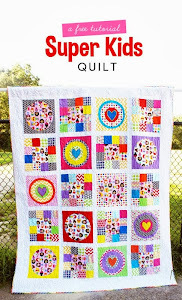 This quilt was going to be published in a magazine, but just when I thought everything was settled, I learned that it would not be featured after all. It was definitely disappointing news to learn but I am chalking it up to a "first world problem" and I have moved onto the next project..... drum roll please..... I have finished my oldest UFO!!!! I will share that in my next post. I hope my stateside readers had a great 4th of July. I have a mean sunburn after yesterday's festivities. I made sure to douse my kids in sunscreen but forgot to do my own! I prefer the look of a print on the back to a solid and usually find that I can purchase a print on clearance for far cheaper than buying yardage of a solid. I keep my eye out for fabric.com steals as well as other sales and generally aim to spend no more than $5.50 per yard. Kona is 5.49 per yard at the most affordable site that I know of- so if I can do better than that, I do! I think pieced quilt backs look awesome - but usually by the time that I get to the part of making the back - I just want to be done. Additionally, I usually like the fabrics I have used for the front and I don't want to use them all up by putting them on the back. 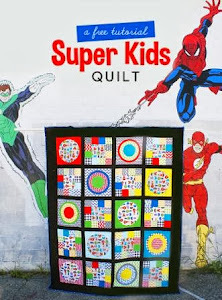 I would love to hear the strategies my readers have for quilt backings. Thanks for reading.